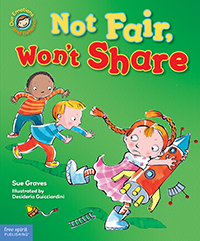 Sue Graves is a former teacher and a published author. She writes fiction and nonfiction for children from preschool to high school. When Nora, Dan, and Henry have trouble sharing at school, they all end up feeling mad. With the help of their teacher, the friends learn that when kids get frustrated, there are ways to calm down, share, and play fairly. Age Focus: 4-8. Hardcover, 32 pgs.